Most homes have what’s called a storage tank model water heater which stores water in a tank until it is needed. A tankless water heater heats water upon demand and offers endless hot water. TK and Sons offers the top models available and, depending on the size of your home and family, will recommend the perfect model for your needs. 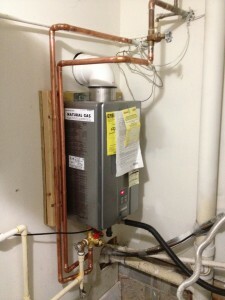 In addition to a new installation, TK and Sons also repairs and replaces tankless water heaters.